And still they come. I went a good few years, a good few too many years, without seeing Pelléas et Mélisande in the theatre. More recently, I have seen several productions, every one of which has had something different to tell me, some different way of moving me – whilst all remaining very much faithful to what, in idealist metaphysical mode, I might term the inviolate spirit of the work. I might not, of course, but perhaps the temptation to do so tells us something about Pelléas and not just about me. 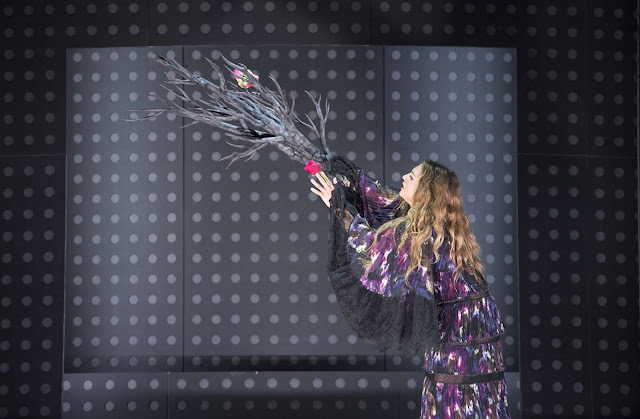 Like Tristan und Isolde – another of the relatively small number of works Barrie Kosky said he was determined to direct, and has also ticked off – there seems to be no point in trying to turn Pelléas into something that it is not; like Tristan, there seems relatively little to do; like Tristan, it seems quite resistant to many typical directorial interventions. None of those is necessarily a categorical statement; such would be bizarre. (Indeed, such might make me something akin to a fevered writer for the Revue wagnérienne. Whatever my failings and/or eccentricities, I am not sure that I am quite there yet.) If something works, it works; and, like many, I can hardly wait to see what Stefan Herheim, present in the audience last night, will do with Debussy’s sole completed opera next year at Glyndebourne. I shall have to, though, as shall we all. 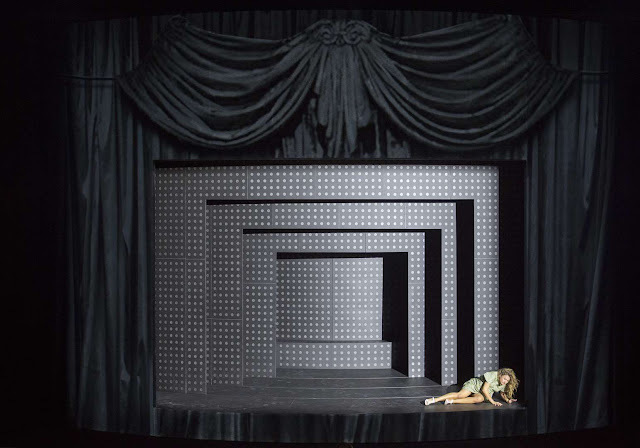 Barrie Kosky’s new production for the Komische Oper certainly proved plenty to keep us going in the meantime. Not, of course, that we should view it in anything other than its estimable own right. At its heart stands Arkel’s Allemonde castle. It is evoked clearly, claustrophobically, chillingly, and perhaps above all, simply. At the centre of the stage, concentric circles turn to reveal something that is always the same, moving yet not moving, just like the characters it transports. There is no way out; nor does anyone, save of course for Mélisande, seek one. (Whether Pelléas does in the opera is a moot point; I do not think he does here. Indeed he remains in the gallery of frozen souls, not unlike a Bluebeard collection, at the close: dead, yes, but was he, were they, always so? What on earth, or beyond, might it mean to be alive here?) Characters move simply, repetitively, if not quite so repetitively, certainly not with such meaninglessness, as in Christiane Pohle’s Munich production (roundly dismissed, I am tempted to suggest misogynistically, by ignorant journalists and audiences alike, but an unforgettable piece of post-Beckettian theatre). Parallels are drawn, easily discerned, given the essential simplicity of the pared-down action; for instance, Mélisande’s arms, her form as yet unseen, encircle – irony here, ‘Ne me touchez pas!’, doubled when it becomes clear quite how fearful she is of being touched – Pelléas at the opening of their final scene together just as they had Golaud at the start. She touches both, though barely. What is she doing? Finding her way? Through fear? Through the forest? Through a miserable, impossible life? And there is no doubting her abuse. The fear is palpable, great tribute to the extraordinary performance given by Nadja Mchantaf, a worthy successor to her Rusalka for the same company and director. In context, many similar themes emerged, for that too had proved a highly concentrated piece of musical drama on Kosky’s – and everyone else’s – part. The fear is well-founded too, for in this world of highly damaged, highly damaging people, Mélisande will suffer horrendous violence. She has done before: you can see it in her eyes. Indeed, Mchantaf’s acting alone would be worthy of any stage: not, of course, that it really makes sense here to speak of ‘acting alone’. When she and Pelléas finally have their moment of sexual congress, she shows her ‘enjoyment’; but is that just what she has learned? Is that, in a sense, what many women have learned? What does it mean to be penetrated by the male gaze, as well as otherwise, on stage? Golaud’s quite shocking violence towards this heavily pregnant woman, his wife, the mother of ‘his’ child, having discovered her with his brother, now dead, is all the more shocking for taking its leave within a general increase of violence – which here seems to mean much the same as ‘action’ – following the interval. The gears of ‘fate’ grind, following relative nothingness. Yet what does it mean for us to label them as ‘fate’? Are we not thereby abdicating responsibility? Blood tells its own story, not just, or even principally, of childbirth, although it certainly includes that. We remember that disturbing moment, earlier on, when Mélisande had laughed childishly with Pelléas, at throwing away – here swallowing – her ring. Again, we both fall upon ideas of fate, and know that we should not. The final turning of the set’s concentric circles, the final display of things just as they always were, yet worse, brings the curtain down. The curtain, having been there all along, reminds us that our aestheticisation of such deeds is at least part of the problem; or at least, it is in itself unlikely to prove to be a solution. Does a performance of Pelléas make us in the audience better people? Who knows? Probably not, however. Things carry on as they always did. If Mchantaf were, perhaps necessarily, first among equals, then that should be taken in its fullest, dialectical sense. 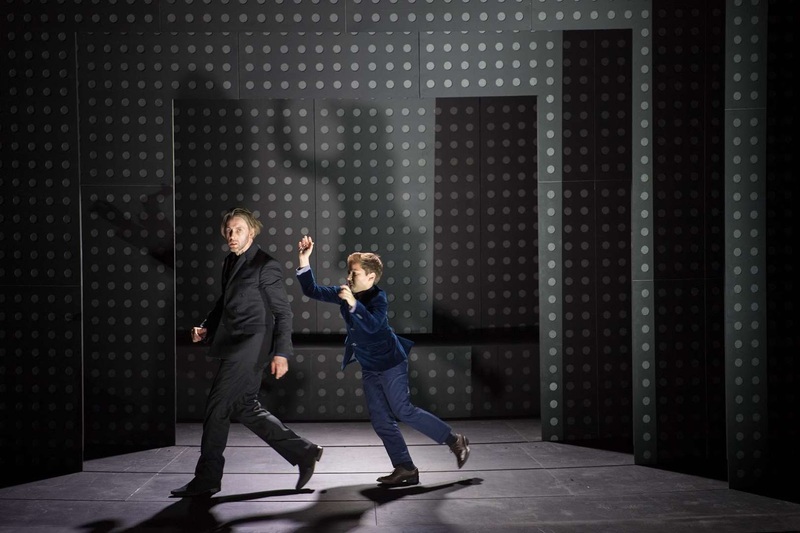 Yet again, the Komische Oper under Kosky’s Intendanz – this certainly includes the work of other directors – showed itself to be a true company. Günther Paperdell and Dominik Köninger showed a near ideal blend of similar physicality – deliriously so at one point, the one almost assuming the role, or rather the behaviour of the other – and of difference, Dinah Ehm’s splendid, simple costumes very much contributing to that dramatic end. Theirs was a dialectical relationship, more strongly so than I can otherwise recall. Jens Larsen’s Arkel proved frighteningly creepy: finely sung, and repellent in his assault of Mélisande, all the more so for his grandfatherly concern. We knew whose rules, doubtless inherited, prevailed in this hopeless patriarchy. Nadine Weissmann’s Geneviève proved deeply compassionate yet – quite rightly – powerless. What could she do? Samuli Taskinen, a member of the Opera Studio, impressed in his small roles. And Gregor-Michael Hoffmann offered a sensational performance as Yniold: crystal clear of tone and words, effortlessly at home, or so it seemed, in a fiendishly difficult role both in work and in performance. It was an extraordinary thing indeed to learn afterwards that this was that outstanding treble’s first role on stage; it will surely not be his last. Of course, so much of the drama, just as in Tristan, in whose waves Pelléas is soaked almost as much as it is as those of Parsifal, lies in the orchestra. It was on splendid form throughout, textures admirably clear yet never too clear. I always find myself in performances of this opera asking myself whether it is a more or less Wagnerian performance; I seem unable not to. The strange thing, however, is that, however different the path taken, the balance between Wagner and not-Wagner seems to end up being about the same; or at least that is so, in a performance worth its salt. This performance certainly was, wisely led by Kapellmeister, Jordan de Souza. There was no doubting his knowledge and understanding of Debussy’s tantalising, treacherous score, nor of his ability to communicate to both orchestra and audience. Again, I look forward to hearing more from him. For ultimately, as always, it is the music of those interludes that lingers longest, most insidiously in my mind. There is something almost evil about it; for it is the music of fate, of Allemonde, perhaps even, at one remove, of the Revue wagnérienne.